Due to the robust construction and ease of control, three-phase asynchronous motors are widely preferred over many other motors for the AC motor driven applications. This three-phase motor is accountable for larger load operations in several applications like goods and lift hoists, conveyors, compressors, pumps, ventilation systems, industrial fan controllers, etc. With the invention of adjustable speed drives and several other types of motor starters, three-phase motors have become favorable drives for variable speed applications. As these motors are important in load driving, it is also important to ensure their safety & protection against starting inrush currents, overloads, single phasing, overheating and other faulty conditions. Before going into the details of these motors and their protection systems, let us look on three-phase motor basics. Three-phase or poly-phase motors are of mainly two types: induction or asynchronous motors and synchronous motors. Synchronous motors are special types of motors used in constant speed applications, whereas most of the motors used in the industrial applications are of induction type. This article concentrates only on three-phase induction motor and its protection. These motors are squirrel and slip-ring type induction motors. Three-phase induction motor consists of a stator and a rotor, and there is no electrical connection between these two. These stator and rotors are made up of high-magnetic core materials with less hysteresis and eddy current losses. The Stator consists of three phase windings overlapped with one another at 120 degree phase shift. These windings are excited by three-phase main supply. This three-phase AC motor rotor is different for the slip ring and squirrel cage induction motors. In a squirrel-cage motor, the rotor consists of heavy aluminum or copper bars that are shorted on both ends of the cylindrical rotor. In a slip-ring-type induction motor, the rotor consists of three phase windings that are internally starred at one end, and the other ends are brought outside and connected to the slip rings mounted on the rotor shaft, as shown in the figure. With the help of carbon brushes, rheostat is connected to these windings for developing a high starting torque. Principle of Operation: Whenever three-phase supply is given to the three-phase stator winding, a rotating magnetic field with 120 displacements at constant magnitude and rotating at a synchronous speed is produced in it. This changing magnetic field travels over to the rotor conductor causing to induce a current in the rotor conductors according to the Faradays laws of electromagnetic induction. As the rotor conductors are shorted, the current starts to flow through these conductors. According to the Lenz’s law, these induced currents oppose the cause for its production, i.e., rotating magnetic field. As a result, the rotor starts rotating in the same direction of the rotating magnetic field. However, the rotor speed must be less than the stator speed – otherwise no currents are induced in the rotor because the relative speed of the magnetic fields of the rotor and the stator is the reason for rotor motion. This difference between the stator and the rotor fields is called slip. Due to this relative speed difference between the stator and the rotors, this 3-phase motor is called asynchronous machine. Three-phase induction motors are accountable for 85 percent of the installed capacity of the industrial driving systems. Therefore, the protection of these motors is necessary for reliable operation of loads. 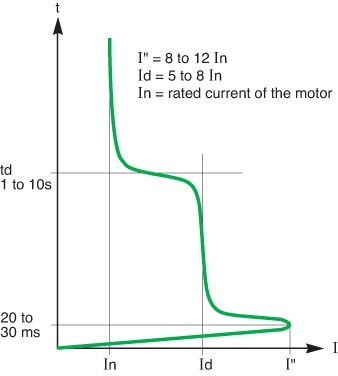 Motor failures are mainly divided into three groups: electrical, mechanical and environmental. Mechanical stresses cause overheating resulting in the rotor bearings’ wear and tear, whereas the over mechanical load causes heavy currents to draw, and thus results in increasing temperatures. Electrical failures are caused by various faults like Phase-to-phase and phase-to-ground faults, single phasing, over and under voltage, voltage and current unbalance, under frequency, etc. In addition to the motor protection systems for the above mentioned faults, it is also necessary to use three-phase motor starter to limit the staring current of the induction motor. As we know – in every electrical machine, when supply is provided, there is opposition to this supply by an induced EMF – which is called back EMF. This limits the current drawing by the machine, but at the beginning, the EMF is zero because it is directly proportional to the speed of the motor. And therefore, the zero back EMF’s huge current will be drawn by the motor at the start, and this will be 8-12 times the full-load current as shown in the figure. To protect the motor from the high-staring current, there are different staring methods available like reduced voltage, rotor resistance, DOL, star-delta starter, auto transformer, soft starter, etc. And, for protecting the motor from the above discussed faults; various protection equipments like relays, circuit breakers, contractors and various drives are implemented. These are some of the protection systems for three-phase induction motors against starting inrush currents, overheating and single phasing faults with the use of microcontroller for low-level applications for better understanding of the students. This soft start of induction motor is the modern method of starting that reduces the mechanical and electrical stresses caused in the DOL and star delta starters. 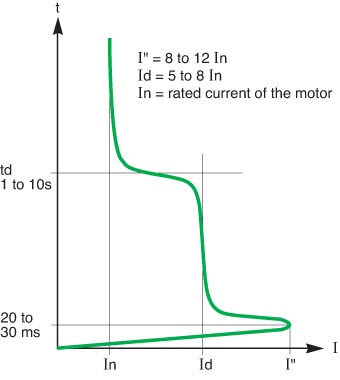 This limits the starting current to the induction motor by using thyristors. This 3-phase motor starter consists of two major units: one is power unit and the other control unit. Power unit consists of back to back SCRs for each phase, and these are controlled by the logic implemented in the control circuit. This control unit consists of zero voltage crossing circuit with capacitors for producing delay time. 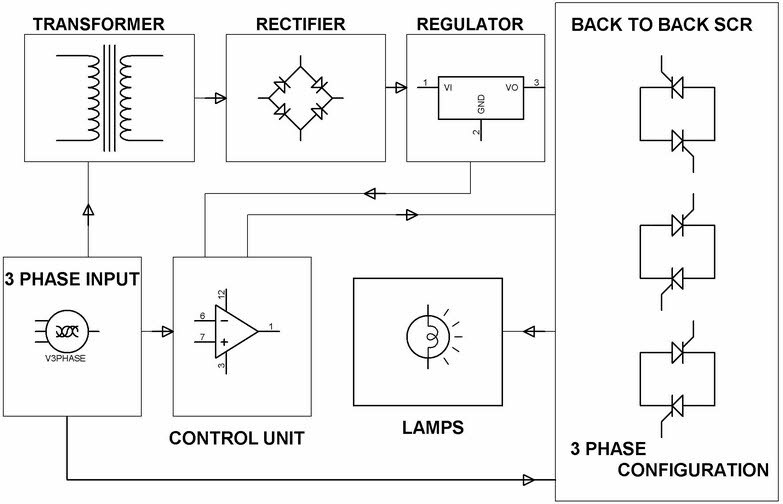 In the above block diagram, when a three-phase supply is given to the system, the control circuit rectifies each phase supply, regulates it and compares for zero crossing voltage by operational amplifier. This Op-Amp output drives the transistor, which is responsible for producing time delay with the use of capacitor. This capacitor discharging enables another Op-Amp output for certain time so that Opto-isolators are driven for this elapsed time. During this time, the opto-isolator output triggers back-to-back thyristors; and, the output applied to the motor is reduced during this time. After this starting time, a full voltage is applied to the induction motor, and hence, the motor runs at full speed. 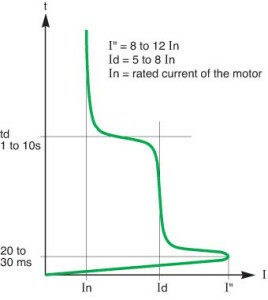 In this way, zero voltage triggering for certain time period at the starting of an induction motor deliberately reduces the starting inrush current of the induction motor. This system protects the 3-phase AC motor from single phasing and overheating. When any of the phases is out, then this system recognizes it and immediately turns off the motor, which is powered by the mains. 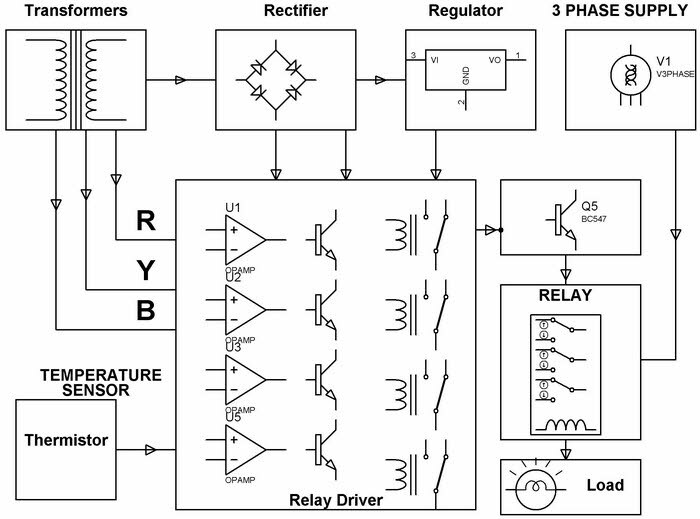 All the three phases are rectified, filtered and regulated and given to operational amplifier where this supply voltage is compared with certain voltage. If any of the phases is missed, then it gives zero voltage at the Op-amp input, and therefore, it gives low logic to the transistor which further de-energizes the relay. Hence, the main relay gets turned off and the power to the motor is interrupted. 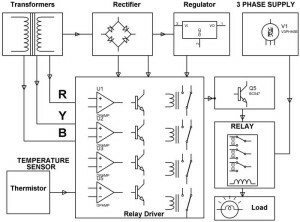 Similarly, when the temperature of the motor exceeds certain limit, the operational amplifier output de-energizes the appropriate relay; even then also the main relay gets turned off. In this way, the single phasing faults and over-temperature conditions can be overcome in the induction motor. This is all about three-phase motor protection systems against starting inrush currents, single phasing and overheating. We acknowledge that the information given in this article is helpful for you for a better understanding of this concept. Furthermore, any help for implementing these projects or others, you can contact to us by commenting below. So helpful for learners and also for all. Thanks a lot. What and what does a motor protection system consist of? from 3 phase power supply to the induction motor. what and what exist in between? Am working on a research on design of electrical system protection of a high voltage motors. 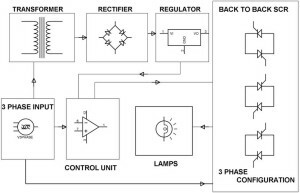 sir please find this full circuit diagram of this protection system because of i dont know how to connection of this block diagram..
We can’t able to find the Circuit diagram and also can we know the title of your Project? sir,please help me in project thesis and presentation seminar presentation.my project is protection of busbars and ht/lt motors. please help me in project thesis about induction motor protection system? Please follow the link: https://www.edgefxkits.com/induction-motor-protection-system for your exact requirement. You can download project abstract and seminar presentation also from the link. sir,in above single phasing protection scheme which driving circuit is used for main relay? We do not deal with Mat lab projects. We deal with hardware based projects in the areas of Embedded, Electrical, Robotics, Communication, Solar, Power Electronics, General Electronics and Sensor based.